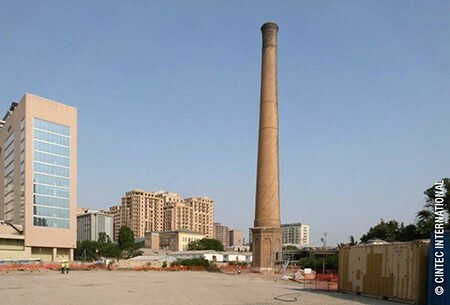 A historical industrial chimney in Azerbaijan has been structurally bolstered and preserved to eventually serve as the centerpiece of a new mixed-use development. January 5, 2016—The Azerbaijan capital of Baku is one of the largest and oldest ports on the Caspian Sea. The metropolitan area’s approximately 4 million residents can trace the rich history of the region back to the Bronze Age, and several prominent and preserved buildings in the city date to the 12 th and 13 th centuries. So it comes as no surprise that as the oil-rich area undergoes a dramatic urbanization leaders seek to maintain connections to an industrial past.